My Stool is 28 inches high with a 28 inch footprint and the seat is 12 inch by 1 ½ inch. 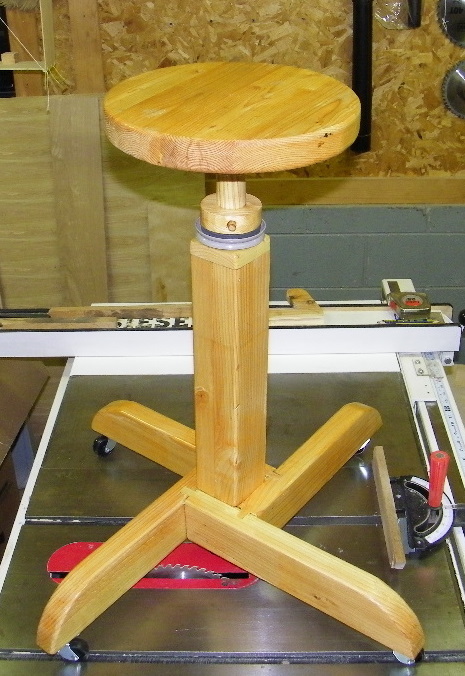 The entire stool is made from 2 each – 2” X 4” X 8’ pine boards and a 1 ½” dowel that I picked up at my local Home Depot. There is one piece of ¾” pine on the top of the column. 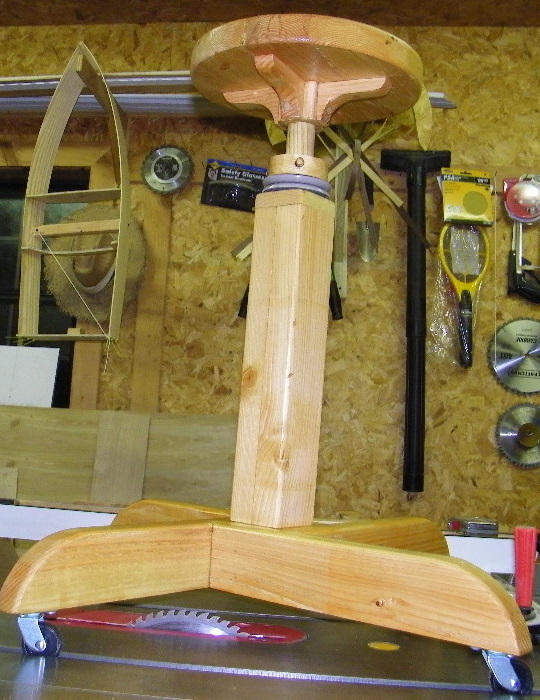 Other than the casters and the furniture sliders the entire stool is made of wood and glue. Finish is MINWAX Helmsman spar urethane. My greatest challenge in this build was not having the proper tools to drill a 1 ½” hole in a 2” X 2” block of wood. I learned real quickly that it is a lot easier to drill the hole in a 4” X 4” block then cut it to the 2” size needed. I was also very optimistic with my design for a one or two day build. Without the extra time I would have not made the deadline. My inspiration for this build was a 5 gallon bucket. I am physically challenged so I need to sit down a lot to do some simple things like adjust the blade angle on my table saw. I have been pushing around this 5 gallon bucket on my shop floor for long enough. Thanks to Chris Wong and FlairWoodworks for motivating me to “Kick the Bucket”. The stool is on wheels and does pivot. To make the pivot smooth I encircled the 1 ½” dowel with 2 furniture sliders. Works great. This was a fun and educational experience and I am pleased with the results. For future consideration I may add a backrest.